Allegro Industries is offering plastic and metal defibrillator wall cases for government facilities and other public buildings. Allegro Industries’ plastic defibrillator wall case is made of corrosion-resistant ABS plastic with high visibility graphics. The unit comes with three optional slide-in shelves. Another model is available with a strobe. The fully sealed, waterproof strobe is available with an audio alarm. The alarm sounds off at 130 decibels. Features include 6- by 10-inch window and right-hand door opening. The unit’s 9-volt battery-powered alarm goes off when the door is opened. The firm’s metal cases are constructed with corrosion-resistant steel and feature a door-front window and latch handle. Metal case comes in corrosion resistant electro-static white finish. The small metal defibrillator wall case with alarm is equipped with a battery-operated audio alarm. Another model, with strobe, is equipped with battery-operated audio alarm and a fully sealed waterproof strobe. The manufacturer also carries a defibrillator bag (pictured on left) that is designed for easy transport and storage. 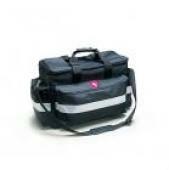 The bag features double a zipper for easy access, shoulder strap and padded divider for protection. Foam padding protects the defibrillator, and the moveable Velcro divider accommodates any size defibrillator. The unit can be adjusted to fit the size of the available cargo area. Allegro has 29 years of experience in the safety industry. The firm designs and manufactures their products for convenience and ease of use in the field.